Ben M'Hidi: "It's hard to start a revolution. Even harder to continue it. And hardest of all to win it. But, it's only afterwards, when we have won, that the true difficulties begin. In short, Ali, there's still much to do." 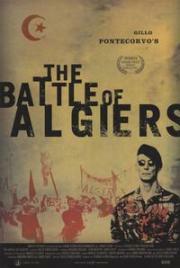 Good gritty film about the escalating tactics of a modern revolution. Made great by its imposing relevance not only for political history but also for the history of western depictions of war on film. It's the kind of movie that is virtually inseparable from its real world context & thus hard to rate on its own merits. Its rough documentary-style look at a moment of modern insurgency warfare is impressive & sobering by any measure although the perspective it offers beyond that is very limited. A highly political movie based on true events that's not self-important mawkish oscar-baiting trash. I didn't know those existed. Rant aside, the realist style works exceptionally well with the impartial presentation and gives a strong sense of objective, almost documentary, accuracy.